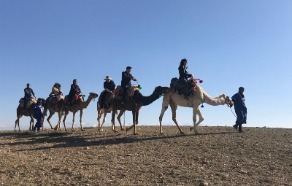 Senator David Norris, journalist and broadcaster Victoria Mary Clarke, Crystal Swing’s Derek Burke, singer Dana, comedian Alison Spittle and Olympian David Gillick show us the highlights of Morocco in ‘Celebrity Globetrotters’, a new six part travel series which starts on RTÉ One on Thursday 14th March at 8.30pm. Produced by Northern Ireland-based Production Company Waddell Media, the show is executive produced by Teresa Smith for RTÉ and Jannine Waddell for Waddell Media. The series producer is Maggi Gibson, Evan Chamberlain directs, Lindsay Tweedie is production manager, assistant production manager is Milene Fegan, Dave Perry and Michael Quinn are on cameras, and sound is done by Mark McMaster and Finny Byrne. In each episode one celebrity takes the lead, bringing their fellow travellers on their chosen itinerary. So will they all get on, or will sparks fly? First up, it’s Senator David Norris whose natural enthusiasm for Marrakesh shines through as they embark on a walking tour of the city starting at the Koutobia Mosque, before stopping off to see the famous Yves Saint Laurent Majorelle Gardens and shopping for carpets. In the evening time it’s all change as they enjoy a caleche ride, meet snake charmers and eat sheep’s brains! “In the evening in Marrakesh, the atmosphere became sinister as the sun fell and then these dark-eyed mysterious men came and they were making noises and movements and there was the sound of flutes playing and then to my horror there was a cobra with his crest fully expanded. Aaarrrgghh, It was ghastly. But Victoria Mary Clarke, who does appear to have some sinister traits, took one wrapped it around her neck and she seemed to be quite satisfied. I eventually ended up with one of the bloody things around my neck. From the lofty Atlas Mountains to coastal Casablanca with stops in Rabat, Chefchaouen, Fez and Berber villages along the way, the celebrities take to the skies in a hot air balloon, haggle in the souks, enjoy traditional Moroccan cuisine and take part in local entertainment as they make their way through the kingdom. ‘Celebrity Globetrotters’ starts on RTÉ One on Thursday 14th March at 8.30pm.